Robin met Sue, her partner (she calls her "Husbutch"), at work. Sue told Robin she had extra tickets to a Nuggets game and asked if she wanted to go! Sue didn't think Robin would actually accept and didn't really have the tickets!! So she drove down that evening to Denver and bought court-side seats! Awe!! For Robin's 30th birthday, Sue planned her a surprise trip to New York and they saw a show on Broadway (theatre is Robin's passion)! The night of their 6 year anniversary, they went to the top of the Rockafeller where you can see the entire city. That's where Sue proposed!! They got married a year later on January 7, 2017!! Unfortunately, the venue they wanted was not available that day, so they said their vows outside the church in the snow with a photographer/witness and signed their wedding certificate. It was kind of like an elopement, very special and intimate. A couple weeks later, on January 22, is when they had the wedding! Both the ceremony and the reception took place at the Villa Parker, a lovely Spanish looking venue, in Parker, Colorado. 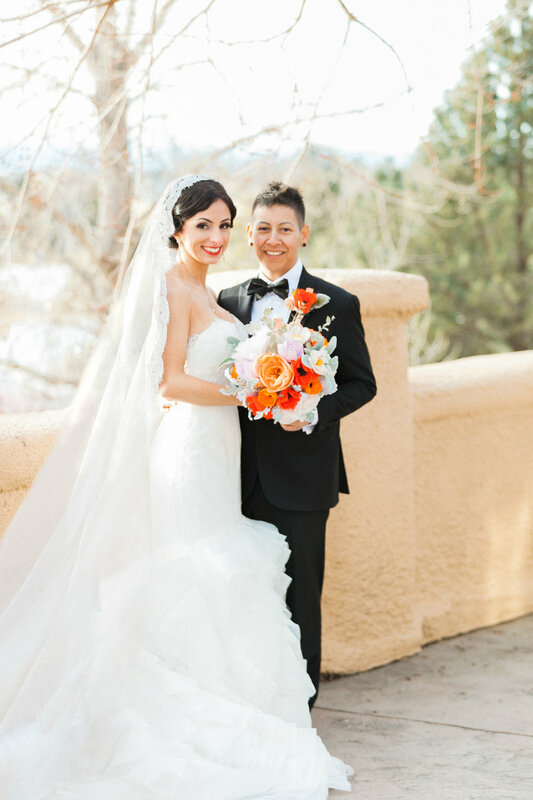 They wanted the wedding to reflect their mutual Mexican heritage, as Robin never really celebrated it growing up, but fell in love with it when she became a part of Sue's family. They picked the Spanish Villa venue and went to Mexico to get decor and gifts for guests! 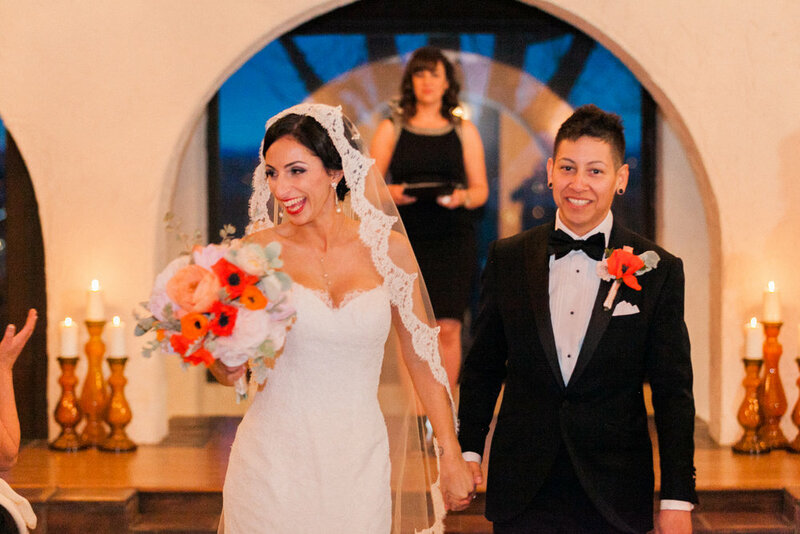 The Grayson gown was the first wedding purchase and decision made; "[it's] so fun and flirty, the ruffles and lace with the sweetheart neckline were so perfect for the theme". Robin's family and friends were with her when she picked it and they said it matched her personality too! Talk about a perfect combo! She ended up having a custom mantilla veil made with corded lace to match the lace on the bodice!! We would like to wish the couple a very happy future together! As well as thank Robin for including us in her special day! !